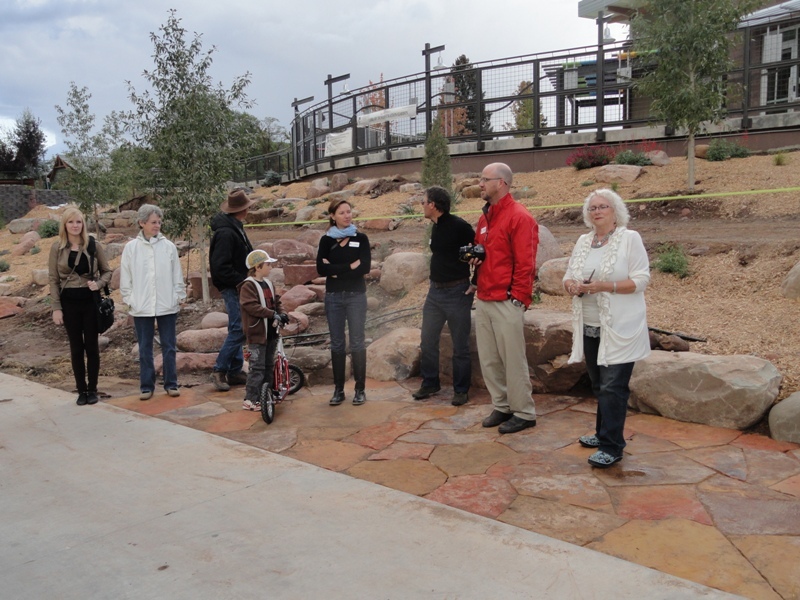 Durango takes a giant stride towards a botanical garden! People are always asking me "What exactly do you do in the way of 'Outreach' "? Well....I travel to places like Durango, where the Durango Botanical Society ran me through my paces a few weeks ago! This redoubtable group is only a few years old, but they already boast a sizeable membership and monthly meetings. Do go back and click on the hyperlink. I think you will be impressed with their activities (and their wonderful website). 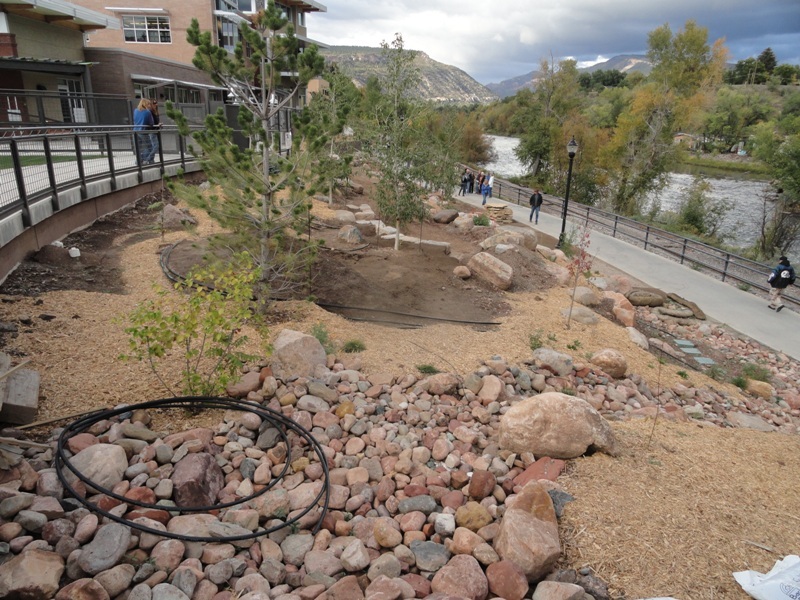 They have also spearheaded the creation of an ambitious garden at the very impressive Durango Library. The garden at this site was designed by Lisa Bourey, an exceptional gardener and inspired designer. You can see a few pictures I took at the marvelous garden she and her husband Drew have created and maintain in a charming neighborhood of that wonderful town. I realize I am full of extravagantly enthusiastic adjectives: Durango does that to one. It is really a gem of Colorado cities. The first plants were planted earlier this summer and they are looking GOOD, I must say. They are, of course, Plant Select choices (as are many of the first plants installed thus far), but there is far more to this garden than just these! 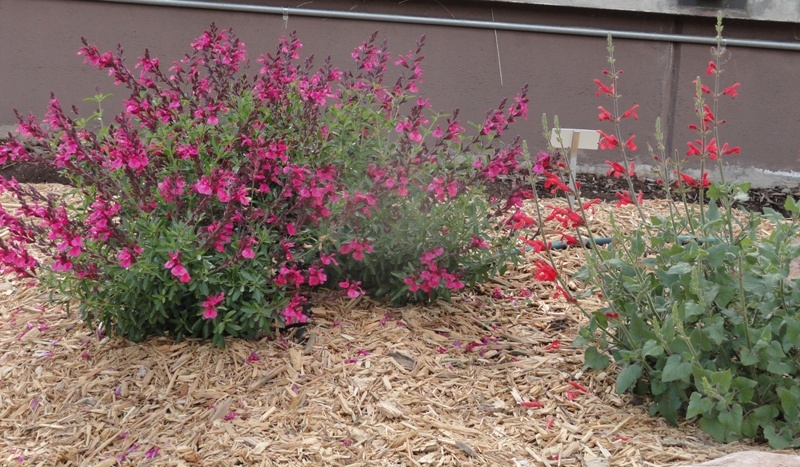 I am very impressed with the range of plants I saw in gardens in and around Durango. They seem to be able to grow most everything we do in Denver (no mean feat with their higher altitude and chill winters). Many plants look better there--their trees don't seem as stressed, and they seem to do very well with more boreal, cool loving plants due to their cooler nights. It seems to really be an ideal climate for many plants. Here you can see some of the principal players who have brought this Society into being, including the President (Cindy Smart, at the far right), looking smart indeed with her chic outfit and gorgeous hair! Darrin Parmenter stands next to her, one of the most dynamic Extension Agents I have ever met (and they are a dynamic lot by and large). Looking leftward is the profile of Jeff Wagner, whom I have known nearly three decades, and one of Colorado's premier plantsmen. Lisa Bourey, the designer, is left of him. The young man on the bicycle was just passing through! And I do not recognize the rest of the rogues gallery, except to say that Societies such as their's take an extraordinary amount of time to nourish and guide. They are to be commended for achieving so much in such a short period of time. Botanical gardens are generally successful only in cities of half a million or more. To imagine and create the first phase of a botanic garden in a city of only 16,000 people is bold indeed! If it were not Durango, I might be a tad more dubious! Traveling to lecture at places like Durango is a great pleasure for me. I received a royal welcome and loved sharing the wisdom of Denver Botanic Gardens, but I feel as though I have gained more knowledge than I imparted. The Four Corners, after all, is really the historical wellspring of our entire West, with Mesa Verde looming nearby. The snowy La Platas gazing down from the north and the vast reaches of Canyonlands and even the Rio Grande valley not far away suggest to me that this is indeed a major botanical center. I believe their Society has much to offer Durango--expanding that great city's conservation footprint and cultural depth, and proffering an important touristic venue into the bargain. We at Denver Botanic Gardens salute you, DBS!